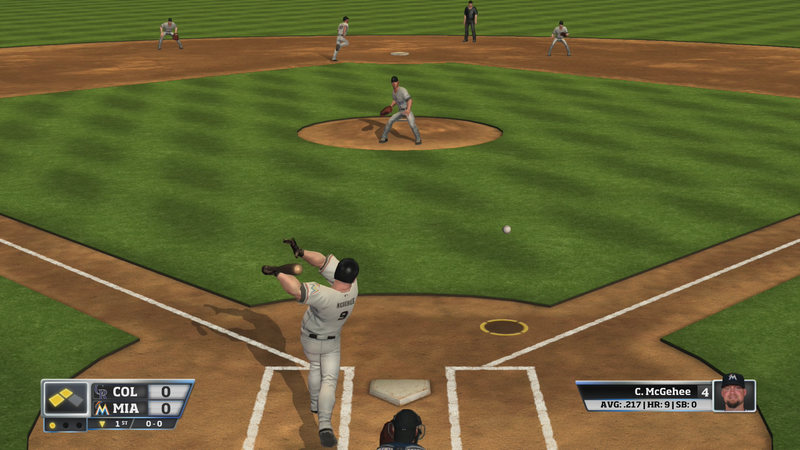 RBI Baseball 14 is a arcade style baseball game that is a re-imagining of a NES classic. All the current teams, players and stadiums are present in about the most basic baseball game you could ever think to make. I’m struggling to find a word that is more basic than basic. This game makes Tic-Tac-Toe look complicated. Are you a gamer who wants to mess with their line-ups? Not here buddy. Do you want to trade players between teams? Not going to happen. Enjoy Manager or Coach type modes? Move along. Are you a min/maxer looking to play the best team? You’ll not find a single power rating of any kind. People are suggesting online that certain players and teams are indeed better that others but the game won’t help you figure that out in any way shape or form. Want to play a game where your options are hit the ball or throw the ball? Now you are in RBI Baseball’s ballpark. There are only two modes in the game; Exhibition or Season. An Exhibition game is a single game and is RBI Baseball’s only multiplayer game which is a local only mode. We’ll get to that in a bit. In Season mode you can play out a full season ending in the World Series or just play the World Series. I don’t want to say that being basic is a negative in itself. It’s more that for a $20 price tag this game seams to be basic just to save money on the design process. Players are represented by a photo and then a pretty basic rendering. The main graphics are first gen 360 at best. Minimal polys and stock standard animations across all players. When fielding a ball the characters will just hold up their glove and no matter where the ball actually is on the field or in the air, its just magically transported to their glove. I’m not talking across the field, these are all catches I would expect them to make, they just don’t line up as they should. Having sloppy animations is not ‘retro’, it’s poor design. The further from the play you get the worse the graphics get. Spectators in the stands are simply box shaped blobs with two long thin rectangles for arms that are constantly clapping together like a seal at Sea World. For me, local only multiplayer is a cardinal sin for this generation. Really it was a sin since Live went live but in today’s age where over 80% of Americans have internet it’s pure and simple laziness. If you want to make a single player game then fine do that. But if you choose to include multiplayer then it has to be online. What is the issue? Your game is as simple as can be, it’s not like there is a lot of data to push back and forth. MLB Advanced Media has said that a upcoming patch would add online multiplayer. That was a post right before launch and we are now almost 2 months past with ZERO communication. All tweets and posts asking for clarification are ignored so I am not holding out hope for it to be added anytime soon. The game uses standard d-pad up,down,left,right to select which base you throw the ball too. Making this d-pad selection at the exact same time as you hit the throw button makes your player throw it a little faster. A nice addition that is not referenced ANYWHERE in the instructions. There is an achievement for fast throwing out a runner trying to score. You have to look up online to find a instruction book from a previous version of the game to even learn about this feature. The AI is yet another area where this game drops the ball. I can name a laundry list of bad decisions and inconsistent play. Let’s start with the worst. If the AI is trying to steal a base, they advance ALL runners. This means if the AI has a player on 1st and 3rd, they are going to try to steal home. It happens almost every game and they will not back down. I see the run, I throw a ball, my catcher gets it and then just waits for the out. EVERY SINGLE TIME. A bunt towards 3rd base is a hit 90% of the time because only the pitcher can get the ball. If it drops RIGHT in front of the catcher, he will stand there and wait for the pitcher to come. Same with a bunt that lands just short of 3rd base. The 3rd baseman will watch it and the pitcher take his sweet time coming over for the ball. 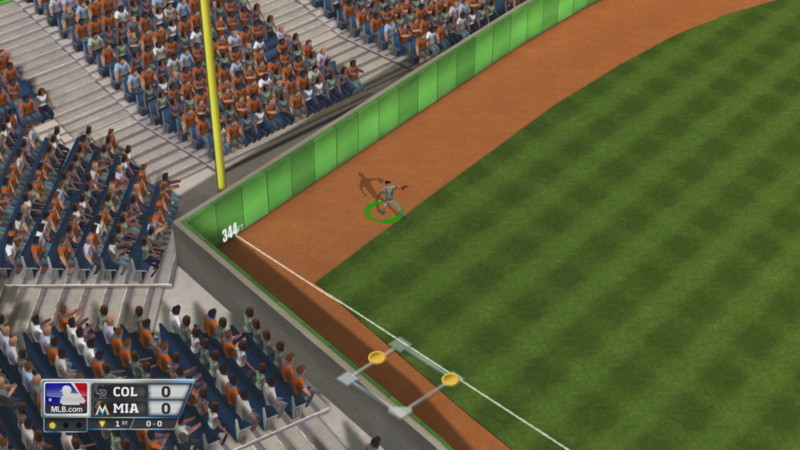 The only thing the AI does right is run bases like a champ. If you twitch the wrong direction on your pass the AI knows it the millisecond it leaves your player’s hand and is on the run for the next base. Their other advantage is they can continue their run smoothly. They round 2nd without a pause but there is no control for you the gamer to pre-round that base. Your player must stop on 2nd before you can tell them to advance costing you time. 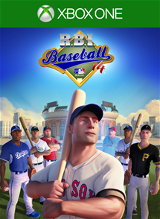 Really the only thing RBI Baseball has going for it is that it’s the only baseball game on the ONE at this point. If you want a sports game you can play quickly head to head with a buddy sitting right besides you and not deal with all the strategy and nuances a Madden or a FIFA has then this is the game for you. Hitting is hit or bunt. Pitching is fast or slow. It’s a game you can play while watching a movie or in the middle of a party and not paying attention to it too closely works in this game’s favor anyway. Their website boasts that this is the first time in over a decade there has been a RBI Baseball game and after playing the game I can tell you that they should of waited even longer. Sloppy AI, complete lack of any kind of management options and dated graphics make this game a strike out for all but the most diehard, need to play a baseball game no matter what, fans.